We're leaving the EU completely and not even trying to keep hold of anything current. All our negotiations will be on agreeing a completely new deal. In some respects probably the best way to go as it makes the negotiations easier with both sides effectively starting from scratch. We're leaving the EU completely and not even trying to keep hold of anything current. Are we? She said we are completely leaving the single market whilst also saying some industries would stay? She said we were leaving the customs union whilst also saying we could have associate membership for some industries? She said we won't be paying into the EU apart from the bits will will pay for? We will be leaving the restrictive rules and regulations but keeping many of them to aid business? We will be leaving completely but having a transition. To me that reads that we're leaving everything and then negotiating 'back in' on a case by case basis and on terms that are amenable to both sides. If we want a tariff free trade we'll probably have to accept something in return like some EU regulations on trade or some payment into the EU coffers (or similar). I'm sure we'll go in there trying to negotiate for passporting rights for the financial sector but it depends on what the EU want in return as to whether we get it or not. At least she's finally said something vaguely substantial on the subject. What has he said that is inaccurate? Large, complex things take time. The two years allowed for implementing A50 will be compressed for the reasons stated. Also, if May is wrong and it can't be done in time then we're screwed and we'll have taken a chunk of the EU economy with us just because, well because Brexit means Brexit. There really is no fallback option, it's Russian roulette with the country with five of the six bullet chambers in the revolver full. Anyone who has ever done anything really complex as a rush job will know that you have to make some pretty severe compromises or shortcuts with risk, there is no way that we can do a perfect negotiation getting us better than we have now (in terms of overall financial position) in two years. The EU countries will have us over a barrel if we try, and if the EU doesn't then small countries who don't particularly like us will in terms of getting it signed off. The consequences of it going wrong are spectacular in their impact on us as a country. That's not an exaggeration, that's not an expert opinion, that's just common sense reality. I've revised my opinion again, May isn't Michael Howard in drag, she's a gibbering moron who I wouldn't trust running a car boot sale stall. Indeed. Or to summarise, marriage is normally simple and straight forward. Divorce is usually messy and complicated. In this instance we are divorcing 27 spouses all at once. I do not believe she is a gibbering moran at all. She was in a very difficult position. First she needed to buy time, which she did through tactics such as putting the responsibility on the SNP for a while. Then she addressed her situation, which is she is PM as decided by the Conservative party and Conservative party MP's in particular. The referendum was called to address a split in the Conservative party. This means that her next moves are to consolidate her position as leader of a united Conservative party at a time when it was keenly split. It was a task that left Boris Johnson scared and ashen faced the day after the referendum. As the party was not united by a decision to remain, she had to leave. A soft Brexit would have left the party divided, a hard complete break on the other hand settles the issue. It does not address business interests, which is why initial prediction of a soft Brexit was wrong. GIven her aims, she has done well. So, she puts the entirety of the UK's fortunes as second place to keeping the Tories together and herself at the helm? There's psychiatric terms for people like that. She not only has put the UK's fortunes at severe risk, she's put the union with Scotland at risk as well by swatting away the olive branch and giving the SNP the moral right to seek a second independence referendum. I think "gibbering moron" has a good chance of being a kind view of history on her. Not just Scotland but Northern Ireland as well. Especially important given the collapse of the power sharing agreement, the brexit divides within the community and the future of the UKs only land border with the EU under threat of becoming a "hard border" again. Location:Village on the Herts/Cambs border. Interests:Late comer to amateur (summer) rugby league. Once again, just like pre Brexit, different groups putting their own figures forward to suit their stance. 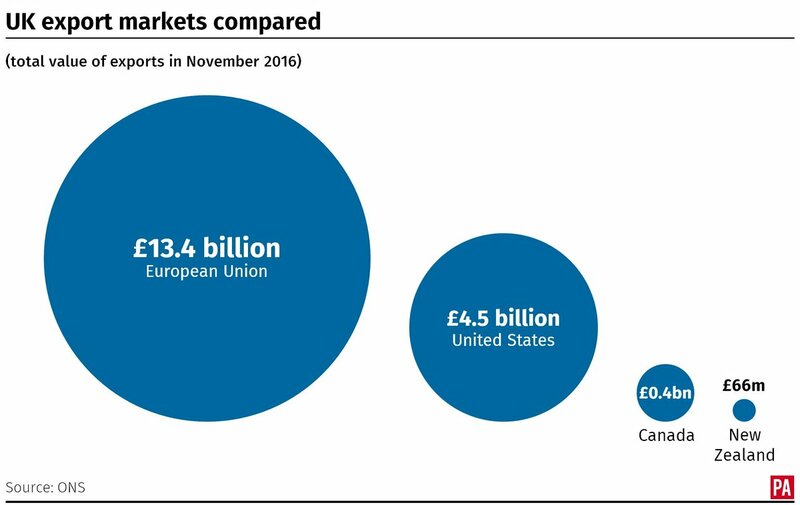 Just been mentioned by one commentator on Euro News that UK exports to EU are less than 40% of the UK's total export market. Do you think I am being too cynical? It seems a reasonable interpretation to me and certainly more reasonable than thinking she is a gibbering moran. As for the term used for people like that, I would assume it applies to many people who become Prime Minister or reach the top in any political system. Depending on your views, "gibbering moron" might be too generous, but it is certainly not accurate. She made it clear that we are exiting the single market, which is obvious to those of us with a brain in full working order given that EU leaders have consistently made it clear that we cannot remain a member of the single market without also retaining free movement of people. Given that one of the clearest messages of the leave campaign was taking back control of our borders, how anyone ever considered anything else is beyond me. The aim is to negotiate a free trade deal. Canada just completed one. Yes, that took seven years, but we start from a different point: we have equivalence with the other 27 states. So there is no haggling over product standards or what have you. She said she was open to some negotiation over the customs union, which is fair enough. But having listened to the best explanation of the whole thing on the BBC from a professor at Lancashire Business School this evening I can't see how remaining in the customs union will make sense because of all the non-tariff baggage that comes with it (for example, there will be constraints on May's industrial policy provisions as a result of being a member of the customs union). She was very positive about our relationship with the EU and very positive about her hopes for the EU, wanting it to be successful. However, she learned from Cameron and decided to play hardball: some member states want punitive terms for the UK to punish us for wanting to leave. I am very glad she basically gave the finger to those member states and asserted that if the EU sought to punish us by trying to force punitive terms we would just leave and rely on WTO rules. Apparently, according to the professor of Lancashire Business School, the trade weighted average of tariffs for EU countries is under 2% although obviously some areas, like farming and fisheries, bring double digit tariffs. But then, as the prof pointed out, we have absorbed a 15% drop in Sterling value and so some higher tariffs could be absorbed and the UK still remain competitive. Again, she undermined Labour by stating she would offer up the Brexit deal for a vote in the Commons and the Lords. Labour and the leader of the Brexit committee have been banging on about this for a while and yet when cornered they cannot explain how a vote at that point would work: if the deal was voted down, what is the alternative? We will have triggered Article 50 so there is no EU membership. She is a crafty lady is Theresa May. Obviously, all that she did today was set out broad but substantive principles about what the government is seeking from the negotiations and where the lines in the sand are drawn. I think she honoured the referendum result by drawing the lines where she did, which is pretty good going for a remainer. The devil is in the detail in some areas of course but I definitely agree with all that she set out on the table today. I think one of the most difficult elements to the negotiations will be Northern Ireland. But at least there is the Common Travel Area ensconced in the EU legal framework already, which will help negotiations I'm sure. And the pound had its biggest one day rise since 2008! I think she is putting Scotland firmly in its place. She has suggested there will be more powers devolved but Nicola Sturgeon will be forced to accept that Scotland can only apply to join the EU as an independent nation, the polls are not showing a majority in favour of another referendum and Westminster under May will not allow another referendum. Sturgeon has boxed herself in and I've no sympathy. Quite so. Too mang remoaners trying to subvert the result of the rerefendum, hoping that the economy will tank, etc just so theg can say "told you so"
By your definitions, you've described someone who would happily watch the world burn just as long as she was still Prime Minister when it happened. Has she actually looked at the opposition? She can afford to take a decision that splits the party almost along 1992-97 lines and still comfortably win in a general election in 2020, in fact, she could probably stand up and announce 50% taxes on those earning under £25,000 and still win going by the state of the Labour party. There is no immediate, mid-term or long-term need for her to overtly shore up the Tory party, she's blatantly put her internal party politics a very long way ahead of the country. Gibbering moron may not be the right term but I think I'm getting to the position where I'd rather have Maggie Thatcher in power than her, and that's me quite comfortably saying this coming from a mining family that suffered greatly under her power. I'd rather have Maggie Thatcher in power than her, and that's me quite comfortably saying this coming from a mining family that suffered greatly under her power. First, welcome to Lancaster House for the launching of this "Europe Open for Business" campaign. We must get this right. Too often in the past Britain has missed opportunities. How we meet the challenge of the Single Market will be a major factor, possibly the major factor, in our competitive position in European and world markets into the twenty-first century. [fo 2] Getting it right needs a partnership between government and business. It's your job, the job of business, to gear yourselves up to take the opportunities which a single market of nearly 320 million people will offer. Just think for a moment what a prospect that is. A single market without barriers—visible or invisible—giving you direct and unhindered access to the purchasing power[fo 4] of over 300 million of the world's wealthiest and most prosperous people. It's not a dream. [fo 5] It's not a vision. It's not some bureaucrat's plan. It's for real. And it's only five years away. Thatcher - April 18th, 1988. Margaret Thatcher would happily watch the world burn for political caprice. I do not see anything to miss there. Her power base is depends on solidifying her position as leader of the Parliamentary Conservative party. The opposition being weak mean that Conservative MP's do not have to unite together. However, some of them are solidly anti-Europe and others have constituency associations who are overwhelmingly pro-Leave. As the Labour party is in disarray, it is the Conservative party she has to worry about. A stronger Labour party would actually give her more cause for hesitation rather than less. She is the Prime Minister of the country. Your statement above is worrying. It may be true, but it is worrying that the Prime Minister puts her party above her nation.